RAWALPINDI: Chief of Army Staff (COAS) General Qamar Javed Bajwa Tuesday returned home after a day-long visit to Kabul, Afghanistan. During the visit, the COAS had exclusive one-to-one meeting with Afghan President Ashraf Ghani followed by delegations level discussions. He also had meetings with Chief Executive Abdullah Abdullah and Commander Resolute Support Mission (RSM) General John Nicholson, an Inter-Services Public Relations (ISPR) press release said. The COAS congratulated Afghan authorities on recent peace initiatives, especially in respect of the holy month of Ramadan/Eid and wished that those steps gained more of permanence, ultimately leading towards an enduring peace. The discussions encompassed wide range of issues, especially the ongoing efforts for reconciliation in Afghanistan, measures needed to check rise of ISIS and the issue of terrorists taking benefit of the porous border to indulge in terrorism, smuggling and drug trafficking, being often networked together. The COAS reiterated that it was the regions and not countries that developed, for which peace and development remained quintessential. He said that having attained relative peace and stability inside Pakistan, efforts were now focused towards socio-economic development as a route towards enduring peace and stability. The COAS said that recently agreed Afghanistan Pakistan Action Plan for Peace and Stability (APAPPS) was expected to bring more cooperation and coordination between the two countries. Referring to border fencing, COAS said that it was an obstacle for checking terrorism and not between people of both sides. The Afghan President thanked the COAS for his visit and recent security initiatives undertaken for peace and stability. The president shared contours of his vision about regional development, efforts to extend ongoing temporary ceasefire and steps related to creating conditions for reconciliation. The Chief Executive also thanked the COAS for his visit and the APAPPS initiative. Both the sides agreed that while results of the bilateral initiatives were extremely important, but even more important was the continuity of the processes to achieve the end state objectives. Talking to the Commander RSM, the COAS said that Pakistan desired that US/ NATO forces must succeed and leave behind a peaceful and stable Afghanistan. Earlier, upon arrival at the presidential palace, the COAS was presented guard of honour. 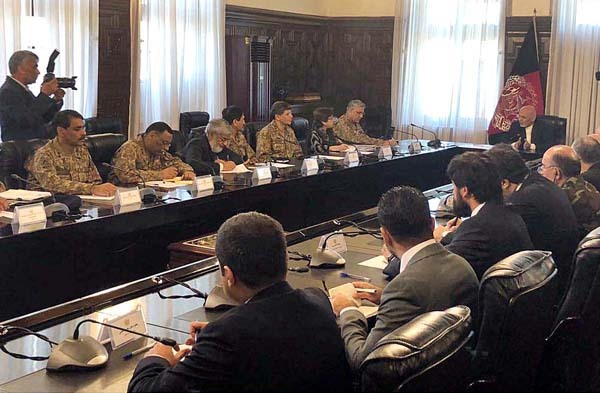 Foreign Secretary, DG ISI, Pakistan’s Ambassador in Afghanistan and other senior officials accompanied the COAS, while Afghan NSA and senior ministers including NDS joined Afghan delegation.